Posted: Wednesday, August 3, 2016. 5:33 am CST. By BBN Staff: The National Hurricane Center (NHC) in Miami, USA is reporting that Tropical Storm Earl continues to gain strength slowly, and may landfall in Belize as a hurricane early Thursday. 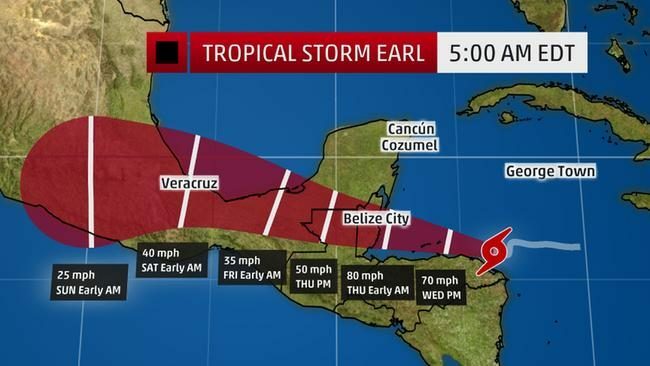 As of 5 a.m., Earl was located about 315 miles southeast of Belize City with maximum sustained winds of 65 mph and was moving west at 14 mph. According to the NHC, Guatemala, Honduras, Belize and Mexico should expect heavy rains with 8 to 12 inches possible which raises the risk of flash floods and mud slides. The tropical storm force winds extend up to 90 miles from its core and the storm’s latest track shows that it will strike Belize within 24 hours.